Above the fold on the front page of The Seattle Times last Friday, Mark Siegel reported on the harm done by highway runoff to our local wildlife, specifically Coho salmon. Researchers from WSU Puyallup found that two and a half hours was all it took to kill adult salmon in water captured from State Route 520. Furthermore, the unique combination of chemicals was difficult to replicate in a lab. To anyone concerned with human impact on the natural world, this highlights the importance of mitigating toxins through new urban development. Thankfully, the article also proposed a solution. Biofiltration using soil as a medium can have a dramatic effect on salmon’s wellbeing. Early in the design of the Fremont Office Building, the project owner made their intentions clear to Weber Thompson: do what we can to minimize the impact to nearby waterways (both the Fremont Canal and Lake Union are within a stone’s throw of the project site at North 34th Street and Troll Avenue). As we started to work with our civil engineer, KPFF and better understand the site conditions, we realized that road stormwater runoff – both from Troll Ave and from the Aurora Bridge towering overhead – currently end up in a dedicated storm drain piped to an outfall on Lake Union. It seems hard to believe: brake dust, motor oil, gasoline, heavy metals and who-knows-what-else are getting deposited directly into Lake Union in every major rain event. This is the same lake we all enjoy from water and land – in our sailboats and kayaks; from Eastlake pocket parks and Gas Works Park. More importantly, this is the same lake we share with the salmon on their annual spawning route. This is the reason for the Ballard locks fish ladder – Steelhead, Sockeye, Coho, and Chinook salmon make their way through the locks to Lake Union and then to Lake Washington every year. Our client understood this, and made the decision to improve water quality in the right of way. This was a completely voluntary act – not required by the city (and in fact, the inclusion of water from the Aurora Bridge might have introduced additional complexity with the Washington State Department of Transportation). 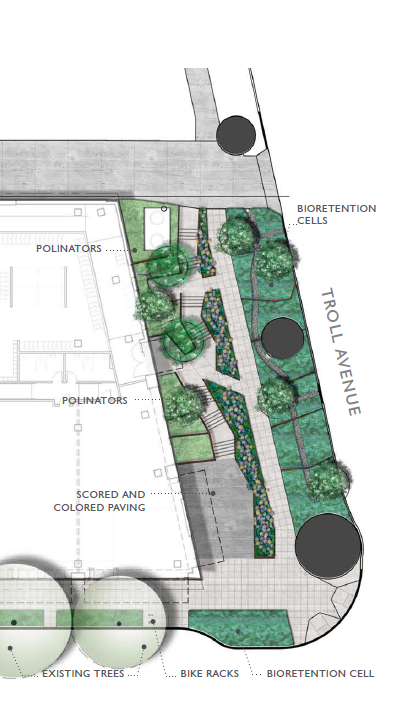 Through collaboration between WT Landscape Architecture and KPFF Civil, the resulting design was a series of cascading bioretention cells (also known as “rain gardens”) – lined areas filled with soil, held back by short retaining walls, between the sidewalk and curb of Troll Avenue, supplemented with bioswales along North 34th Street. The soil provides a natural filtration medium (that WSU researchers determined to be the antidote to the poisoning of the salmon), while also slowing and cooling the flow of stormwater to the nearby catch basin. 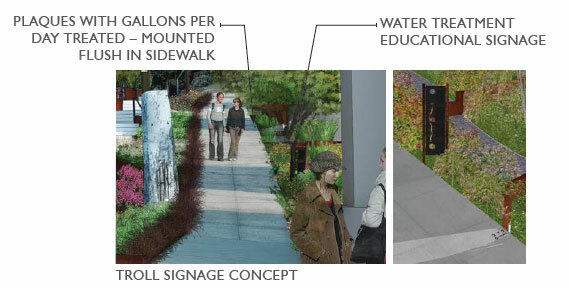 As this bioretention provides a functional benefit to site’s stormwater management, educational signage will engage passersby to tell them what’s going on. A sign at the south end of the cells explains the green infrastructure, and numbers set into the concrete sidewalk subtly call out how many gallons of water each bioretention cell filters at peak volumes through the course of one year. The Fremont Office Building is a 130,000 gross square foot, mixed-use building with four stories of office over a ground floor of retail. In addition to stormwater management, it features energy-efficient design that promotes daylighting and natural ventilation, inspired by our award-winning Terry Thomas office building. 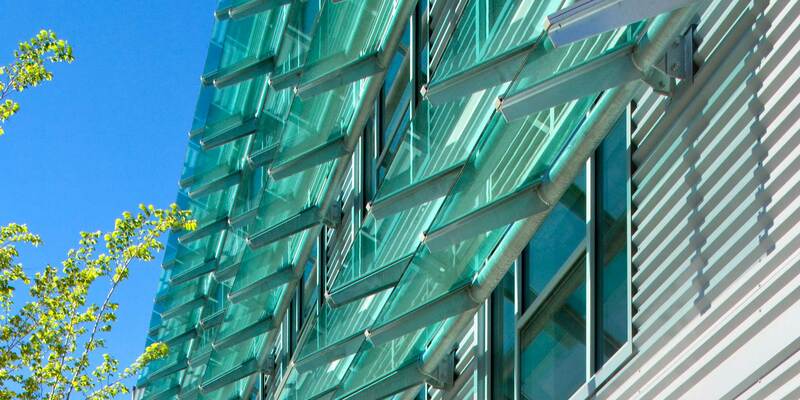 It is targeting LEED Gold certification. The owners, even prior to the decision to pursue LEED certification, had begun the process of Salmon Safe certification, to recognize this stormwater effort above and beyond what is required by the city and state, along with protecting habitat by making careful choices about exterior cladding materials. Salmon Safe is a 501c3 founded in Portland Oregon. Their mission is to transform land management practices so Pacific salmon can thrive in West Coast watersheds. Salmon Safe offers a series of peer-reviewed certification and accreditation programs linking site development land management practices with the protection of agricultural and urban watersheds. They offer a suite of site certification standards including urban development (under which the Fremont Office Building will be assessed) in addition to farms, vineyards, campuses, green infrastructure, golf courses and parks along with developer and contractor accreditations. We’re excited to be a part of a commercial project that not only does less harm, but also does a net positive good for the surrounding environment. Without this development, untreated runoff from the Aurora Bridge and Troll Avenue would continue to flow into the lake and endanger our cherished salmon. Next PostNext Growth in Seattle: Is a downturn coming?